"I am consecrated to God. My end is Love"
The Franciscan Missionaries of Mary is a religious Institute founded by Mother Mary of the Passion (born Helene de Chappotin du Neuville, 1839-1904) at Ootacamund, Tamil Nadu, on January 6, 1877. Stella Maris College is managed by the Sisters of the Institute of the Franciscan Missionaries of Mary. Blessed Mary of the Passion was born on May 21, 1838 in Nantes, France. Since her earliest years God had placed his hand on her and was forming her for a challenging mission through the difficult circumstances of her life. She came to India in 1865 at the age of 26 as a Sister of the Marie Reparatrix Congregation and worked in Tamil Nadu for 11 years having mastered Tamil, the local language. Her love for the people who affectionately called her Passion Thayar, and her bold missionary initiatives for development work and the empowerment of women met with resistance, confrontation and misunderstandings by the local church. Under very oppressive circumstances, she and a group of Reparatrix sisters decided to withdraw from the Marie Reparatrix Congregation. She returned to Rome in November 1876 in order to explain her situation. The Holy Father, having heard her, asked her to write a Rule of Life as she perceived life in the Missions. 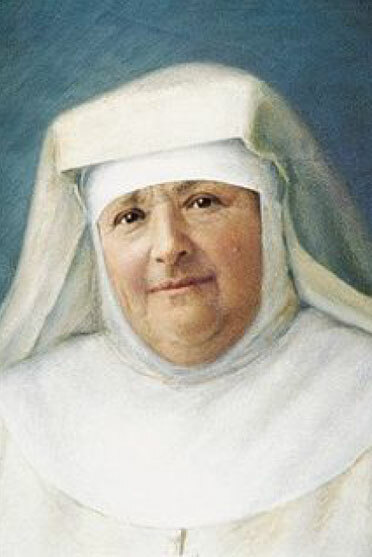 Her Rule of Life was approved by Pope Pius IX on January 6, 1877 and the Institute of the Missionaries of Mary was born. Later in 1882 she affiliated the Institute to the Franciscan Order and the Institute of the Franciscan Missionaries of Mary came into being. She died on November 15, 1904. At the time of her passing away the Institute had spread through Europe, the four continents, Asia, Africa and the Americas, in 23 countries, 80 communities and numbered 2060 Sisters. "An extraordinary woman, marked by a boundless love for the Absolute, strong in times of trial and suffering, always serene, easily forgiving and generous, and outstanding for her indefatigable zeal. She was endowed with nobility of heart, with a superior intelligence, and with a tenacious will, surrendering herself entirely to God by her offering of herself to Him and dedicated to the salvation of souls. She occupied an important position in the Church, and in the evolution of missionary spirituality, and distinguished herself by her renowned holiness, sincerity, and uprightness. " - From the decree, issued in Rome on January 1, 1979, on the occasion of the introduction of the cause of Beatification of Mary of the Passion.